As the Dakota Access Pipeline is about to resume construction protesters have taken to the streets in 55 cities and 26 states across America. These protests are in response to the U.S. Army Corps of Engineers announcement that they will forego an environmental impact statement and grant the final easement needed for the pipeline to proceed. Now that the Army Corps of Engineers has given the green light there are no immediate obstacles preventing the pipeline from being built. All legal options have been exhausted. The Indigenous Coalition at Standing Rock called Wednesday's protest, "an international day of emergency actions to disrupt business as usual and unleash a global intersectional resistance to fossil fuels and fascism." 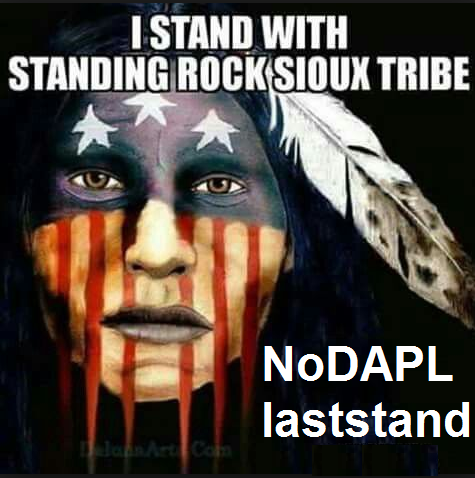 Trump signed an Executive Order fast-tracking the construction of DAPL and then he tried to control the narrative falsely claiming that the decision was not controversial and there is no opposition. At a recent roundtable with County Sheriffs Trump said: "As you know, I approved two pipelines that were stuck in limbo forever. I don't even think it was controversial. You know, I approved them -- I haven't even heard -- I haven't had one call from anybody saying, oh, that was a terrible thing you did. I haven't had one call." Despite Trump's feigned ignorance, opposition to DAPL has been forthcoming from Indigenous Peoples and environmental groups for a very long time. 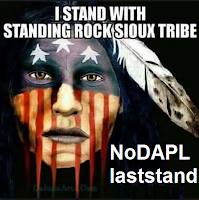 Protectors from more than two hundred Native American tribes participated in protests against DAPL along with military veterans and thousands of concerned citizens. "This blatant disregard for federal law and our country's treaty and trust responsibilities to Native American tribes is unacceptable," the lawmakers wrote. "We strongly oppose this decision and any efforts to undermine tribal rights. We urge you to immediately reverse this decision and follow the appropriate procedures required for tribal consultation, environmental law, and due process." Signatories included Sens. Maria Cantwell (D-Wash.), Bernie Sanders (I-Vt.), and Catherine Cortez Masto (D-Nev.), as well as Reps. Raúl Grijalva (D-Ariz.) and Donald Beyer (D-Va.). It has been a long hard struggle with moments of exalted triumph and now crushing defeat. After the last protest camp was raided at Standing Rock last week people were feeling despair. The situation has gone from bad to worse. Although the situation is dire, given what is at stake people are not prepared to give up. The pipeline project endangers the land and it threatens the drinking water of local residents. It is also a carbon bomb of epic proportions. The 1,172-mile long pipeline will carry a half a million barrels of oil to market each day for a total of 7.4 billion barrels over the lifetime of the pipeline. "Donald Trump will not build his Dakota Access Pipeline without a fight. The granting of an easement, without any environmental review or tribal consultation, is not the end of this fight — it is the new beginning. Expect mass resistance far beyond what Trump has seen so far." The Indigenous Coalition at Standing Rock said, "this is the #NoDAPL last stand." The construction may start soon but so will the protests.